I don’t often get asked to review something outside of the food/ beverage world. 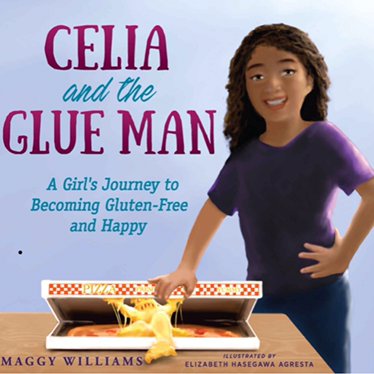 I was recently asked to check out a wonderful gluten free children’s book titled Celia and the Glue Man: A Girl’s Journey to Becoming Gluten-Free and Happy by Maggy Williams. As a Director of a very special Celiac Camp for kids I am very sensitive to the many levels Celiac Disease impacts a child’s life. Beyond the health issues and pain of being sick these kids need to deal with always being different, often feeling left out in activities when food is involved. Having to double check before eating and often remember to bring food just in case something is not avalaible makes being spontaneous almost impossible. This book does an outstanding job of showing the many challenges. “Celia” the main character learns to navigate learning what to eat and the consequences of making the wrong choice by using the image of an imaginary glueman monster as the “gluten”. This book truly paints the full picture of what gluten free kids deal with but all in a fun, easy to read very colorful read. If you have a gluten free school age child I highly recommend grabbing a copy of this wonderful book. Check it out today on Amazon.